Designed to recognize and reward innovative teachers, Ideas with IMPACT is an investment in success that brings out the entrepreneur in our classroom teachers. This initiative provides teachers who have developed successful classroom teaching methods with funds to package and export their curriculum. Ideas with IMPACT also provides stipends to teachers who wish to adapt and franchise these winning ideas in their own classrooms. By cultivating teacher leaders, convening teachers to share best practices, and creating opportunities for teachers' professional growth, Ideas with IMPACT creates a network of support for teachers focused on improving student instruction and meeting student needs. The beneficiaries are the students who receive classroom instruction proven to promote learning and increase achievement. One of the largest "by-teacher, for-teacher" conferences in South Florida, the Idea EXPO brings more than 700 educators together once a year to network and share teaching strategies. 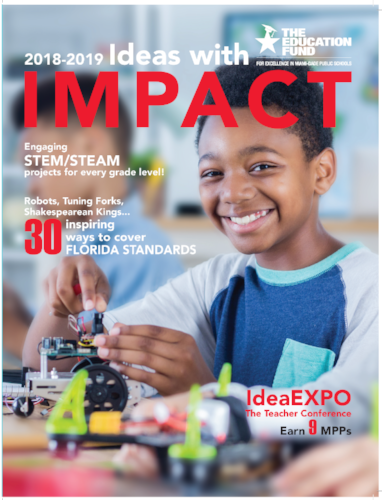 The Idea EXPO features more than 90 workshops led by teachers, a keynote address and master teaching session by a nationally renowned educator, free curriculum packets, breakfast, lunch, and much more. Find out more now! Join us at the 2019 Idea EXPO! 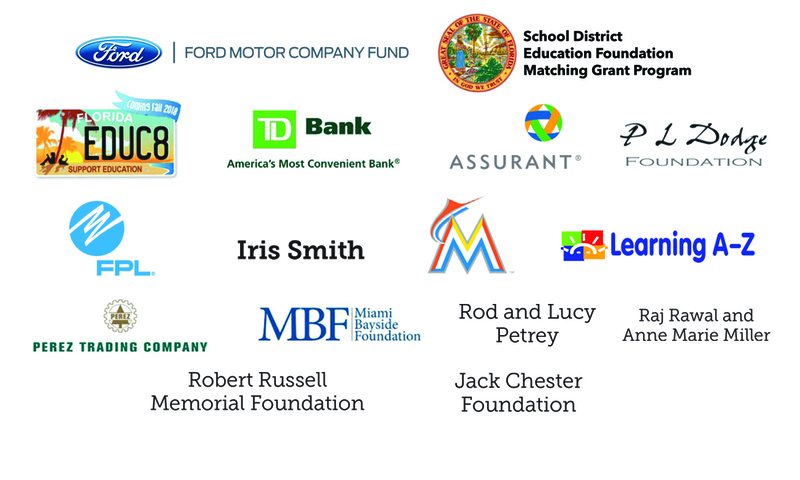 An essential component to the Ideas with IMPACT program is the Ideas with IMPACT catalog, which is published and distributed annually to every teacher in Miami-Dade County Public Schools. This catalog is a resource of teachers' proven ideas, with each page containing a different teaching strategy, information on the students for whom it is appropriate, standards met when implementing the lessons, and contact information for each Disseminator teacher. The teaching ideas in the Ideas with IMPACT catalog, created by teachers for teachers, can be used exactly as they are or modified to meet a classroom's special needs. Subject areas covered include STEM/STEAM, language arts, math/science, social studies, health, technology, varying exceptionalities, and interdisciplinary. Teachers are encouraged to use the catalog as an idea file and keep it handy for reference throughout the year. Ideas with IMPACT catalogs are available to view for every year since 1990. Download the latest catalog. Innovator Grants provide funds to teachers to develop and implement instructional projects that motivate and challenge students to learn. Proposals should be a unique classroom project that enliven and enrich the curriculum. Many past grants have included interdisciplinary, active-learning lessons. Others have reinforced learning through simulations or applied school work to real-life situations. Grants range from $300 - $1,000. Innovator Application Available Fall 2019. Select an idea from one of the Ideas with IMPACT catalogs. Contact the Disseminator listed on the project page of the catalog to request an Idea Packet and discuss with them your ideas for creatively modifying the project. Complete and submit an Adapter application. Be sure to include your creative modifications. Adapter Grant Application Available Fall 2019. An Idea Packet containing course outlines, lesson plans, resource lists, bibliographies, student worksheets, student samples, and other tools is available free of charge for each Disseminator. To obtain one, contact the Disseminator listed on that profile page in the catalog. To see Idea Packets from previous years, click here. Disseminator Stipends offer teachers who have a successful teaching strategy, the opportunity to package and market their ideas to other teachers. Click here to see the Disseminator Application. Registration is limited to the first 100.